Hydrosystem survival is monitored by smolt-to-adult return rates (SAR). SARs are measured by the number of smolts passing Lower Granite Dam divided into the number of adults returning to Lower Granite – one, two and three years later. 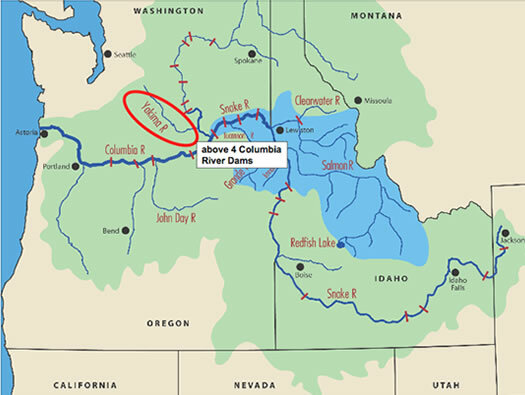 Restoring wild Snake River salmon requires a 2 to 6% SAR [Northwest Power and Conservation Council]. For example – at a 2% return, 2.5 million wild smolts would return 50,000 adults; 6% would return 150,000. Since 1975, when Lower Granite Dam was completed - the last of the four lower Snake River dams - SARs have averaged 1.10% - far from the required 2 to 6%. Also see ISSUE UPDATE for more on SARs. Spring chinook salmon in the Yakima River, above four dams, are not listed under the Endangered Species Act and sustain a 2 to 6% SAR.